The use of red dot scopes has become increasingly more important as advances have been made to camera, point and shoot, telescopic, and lighting resources. Everyone can recognize the movie or TV show scenes that are shot behind the scope of a firearm, pointing and aimed at something. It’s been marketed to the height of its own fame, and with good reason. There are many different varieties of red dot scopes that the industry has to offer, but here, we aim to clear the air on what some of the best red dot sights and suppliers might look like, as well as answer any questions you might have about your red dot sight. Click the buttons above for detailed information about each unit, or read on for our review of each of the top 3 red dot scopes. Our top choice for the best product in this review is the Bushnell Trophy TRS-25. 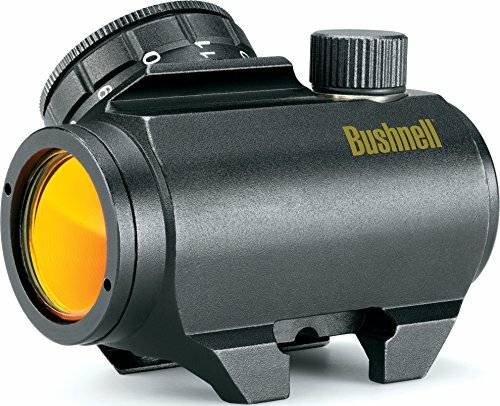 Bushnell has been a leader in the optics industry for the last few decades, so it is only right to expect good things from their red dot scope. This scope is durable, well designed, and priced very competitively, considering the quality. Perhaps the most impressive thing about this sight is how clear the view is looking down the scope. Bushnell has engineered a world-class scope capable of transmitting 91% of the light through the scope, meaning that your target is easier to see than ever. On top of this, the scope will not get foggy or unclear in any conditions, as it is designed to be waterproof, fog proof, and shockproof. The nitrogen filled housing of this scope maintains a crisp, clear picture under any conditions. The red dot is powered by an LED light that is visible in any light conditions. Indoor, outdoor, bright, or low-light, the reticle is very visible. As well, the optics have been specially designed with “amber-bright” optics to help distinguish targets through the scope. Identifying your prey has never been easier than with this scope. The Bushnell TRS-25 is an extremely well rated red dot scope. Earning over 3,000 ratings with an average of 4 stars, both product testers and customers enjoyed this product. People who used this product had these things to say about it: “for the price, this is an excellent sight”, “tough to find another scope that will compare”, and “fits well, great field of view”. Overall, this is the best red dot scope in this price range, and it can be had at a stellar price. The 2nd best option in our roundup of red dot scopes is the Dagger Defense DDHB. This scope offers functionality, while also allowing for reticle customization, all in an affordable package. As stated before, the Dagger Defense scope allows for reticle customization. Offering the option between a red and green dot, as well as four different shaped reticles. This is a very durable scope, built with aircraft grade aluminum. This scope should last a lifetime if taken care of. Another nice design feature included with this scope is the ergonomic body, which saves space for other attachments on your gun. The Dagger Defense DDHB is another highly rated scope, with more than 80% of the reviews being 4 or 5 star. Some things that buyers had to say about this scope: “more than pleased with my purchase”, “optics are bright and easily seen”, and “can’t beat it anywhere for quality & price”. Overall, this is an excellent scope, and the reasonable price makes it even more enticing. The third item in our review of the best red dot scopes is the Ozark Armament Rhino. Although this is the most affordable product to make our list, that does not mean that it is not a quality scope. When this product was designed, the creators has durability in mind. This scope is built with an ultra-rugged design, that is made to withstand the toughest of conditions. To help protect the optics, two flip down covers are included with this package. The scope mounts easily to most weapons with its convenient cantilever mount. This scope also offers customization, with the option to choose between red and green reticles. Another nice thing about this scope is you do not need to worry about buying a lemon. The manufacturer offers a “no questions asked” one year warranty with the purchase of this scope, which is a testament to its quality. The general consensus of product testers was that this is a decent scope for a great price. Some customers had concerns about the sharpness of the reticle, But the insanely low price makes up for that. What’s a Red Dot Scope? A red dot scope is a non-magnifying, target light that is popularly used for aiming firearms. It was invented in 1900, and original models relied on batteries, or were lit by ambient light hitting the reflector (or reflex) sight. It wasn’t until 1975 that optics companies began utilizing “electronic” red dot sights, which introduced the use of the light-emitting diodes. These sights are built to align with the firearm or object with a red LED, which improved the accuracy of the aim. They are used with a variety of different technologies, some of the most common being firearms, cameras, and telescopes. Red dot sights are most easily used for target shooting, hunting, and for police and military use, as they assist with ensuring accuracy of the shots. With cameras, they are used popularly for point and shoots, as well as for photographing flying aircrafts, birds that are in flight, and distant objects. Their use for telescopes allows the user to locate distant objects through a finder scope. Red dot sights are reliant on a series of lens and a reflective mirror. The amount of light that’s allowed into the tube (which is the body of the scope you would look into) varies depending on the lens size, or the tube’s diameter. Larger lens allows more light into the sight. Red dot sights are tiled, spherical mirror reflectors, similar to the interior of cameras, with a red LED light at the focus. The mirror’s coating allows the light to pass through most other light forms, making the sight a strong aid to users who are targeting over longer distances. Ultimately, the way that the sight works for its user varies depending on the size, the material it is made of, whether the mirror or lens has coating, and other factors. While the different types of red dot sights can vary based on its physical anatomy, how they are used with different firearms or technologies can factor in as well. Some of the different red dot sights include smaller sights, such as the Bushnell TRS-25 red dot, and the Bushnell 1x28 Multi Reticle, as well as larger sights such as the , and the Tasco 42mm ProPoint. Not only do all of these sights look different, but also, they function with different types of firearms, and have different features. For example, the Bushnell TRS-25 is a compact sight. It attaches easily to smaller firearms, which makes it useful for users new to pistol training. 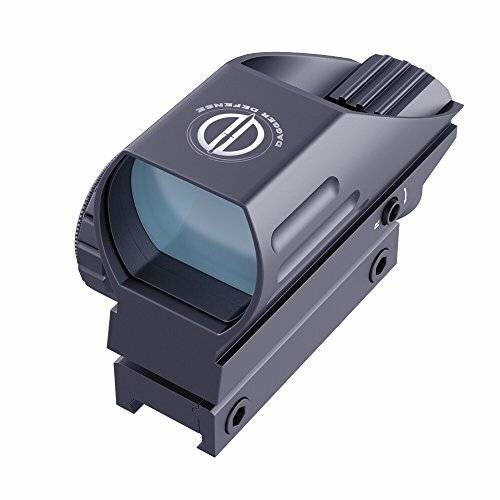 This specific sight is known for its durability and accuracy as it offers a high operating speed and precise balance. The multi reticle is similar in size, but rather than offering a fixed dot size, like most other red dot sights, this version allows the user to sift through eight different options, which helps shooters with precision over longer distances. Larger sights, like the Micro Dot and the ProPoint, are designed to mount to larger firearms. In these cases, the dot brightness can typically be adjusted, and are used for fast and nearby shooting. With the ProPoint, users have the option to alternate between a green and red dot, which can help different users when adjusting their brightness. Red dot sights have been used for decades because of their accuracy and versatility of function. They are made specifically to help users find and zero in on their targets quickly and accurately. The red dot itself is particularly popular because of the introduction of the LED light. LED improves the reliability of the shot, but they also require little power and overall conserve battery life. Their durability and precision combined make them some of the most reliable aids for target shooting, photographing, and astronomical studies. When it comes to firearm use, red dot sights are increasingly popular because of their easy use and positioning. Red dot sights are built to attach to the firearm so that when you use them, the sight and the target are nearly on the same optical plane. This makes for fast and easy acquisition, and allows the user to follow its target with little trouble. There is also no need for eye relief, which is required for magnifying scopes on firearms with heavier recoil. 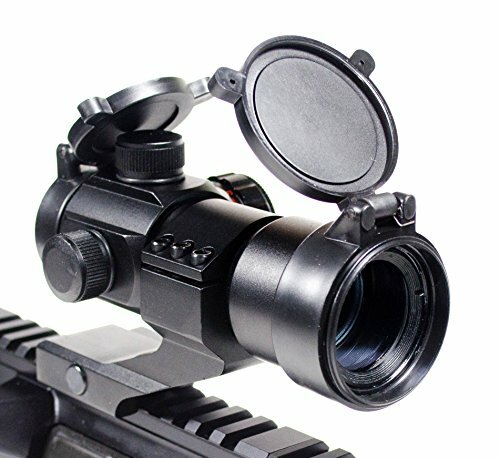 Red dot sights can be adjusted so that the sight itself is not resting against the face or around the eye, but can still be easily utilized and seen through. With the varying models, sizes, makes, and uses, the red dot sight continues to grow in popularity for its wide range of options for targeting. Whether it is out in the field, in military use, following a bird or distant object, or using a telescope, red dot sights hold a lot of versatility for their users. They improve accuracy, minimize damage, and allow users to never lose sight of their targets. As technologies have advanced, the red dot sight has followed suit, making it easier for users to locate and follow their targets with LED accuracy, while making adjustments to conserve battery life, and ultimately make the sight longer lasting. These improvements to red dot sights just keep getting better with time, so make targeting easier, and set your sights on the perfect one.